This is a delightful exploration of both the well-known Big Sur coastline and the little-known inland hills and valleys behind the coast. The trip begins and ends in Monterey. It starts in grand fashion with a tour around the world-famous Monterey Peninsula’s 17-mile Drive before heading south along the rugged cliffs of Big Sur. After two days of cliff hugging and ocean viewing (and an optional side trip to Hearst Castle), the tour heads inland to visit some of California’s best kept secrets: the winding, rolling country roads of San Luis Obispo and San Benito Counties, highlighted by overnights at Santa Margarita Lake and the old Mission San Antonio de Padua. If your only exposure to this area has been a run up Hwy 101 in your car, you will be amazed at the wealth of obscure back roads winding around in the hills and valleys of this region…one of the best cycling venues anywhere. Following a quick spin across “America’s Salad Bowl”—the vegetable farms of the Salinas River Valley—the route heads north and east up into the incredibly gorgeous Pinnacles National Monument. If you do the route the way we have it laid out, you’ll begin your last day on the tour with a hike through the towering, red-rock spires (and canyons and caves) of this geological fantasyland. Done as drawn up, it’s a rare opportunity to go in one side of this roadless wilderness and come out the other side. Once back on your bike, you end the tour cycling down out of the mountains and back toward Monterey via Arroyo Seco and the nearly perfect cycling road down the tree-shaded, creek-hopping length of Carmel Valley. This tour offers exceptional opportunities for exploring off the bike as well as on, with excursions in Monterey, hikes to waterfalls near camp, a visit to one of the best preserved of the early California missions, a tour of Hearst Castle, and best of all, the hike through the Pinnacles. The tour begins in the pines of the Del Monte Forest, high above Monterey, then rolls around the stunning 17-mile Drive. After cruising the storybook village of Carmel, the route heads south along the rock-ribbed cliffs of Big Sur…one of the most impressive stretches of coastline in America. Overnight at a quiet state park, with beach access, a hike to a waterfall, and showers. An intentionally short day to allow time in the afternoon for a tour of Hearst Castle, very close to the overnight campground. 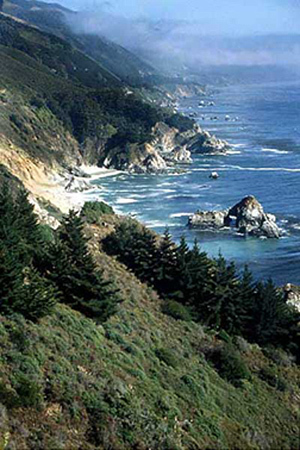 The ride includes more of Big Sur’s rugged cliffs and ocean views before descending to rolling hills next to the beach. For those who would rather ride than tour the castle, there is an optional out-&-back from camp on a quiet country road winding up into the empty hills. Showers and beach access at camp. On the shorter route, the first third of the ride runs either close to or right alongside the ocean, visiting the little beach towns north of Morro Bay. The longer route heads inland on a brutally steep climb (through magnificent scenery) before returning to the coast by way of a series of fast, twisting, totally outrageous descents. The reunited routes then head inland for good on a long, gradual climb over the coastal mountains. Dodging the the city of Atascadero, the route heads south into wonderfully empty country, ending up at a pleasant camp on the shore of pretty Santa Margarita Lake. Showers and a swimming pool. One of the best days on the tour…on any tour! No special scenic attractions; no big climbs or monster descents. Just mile after mile of quiet roads through empty, beautiful back-county. Rolling terrain and winding little lanes that appear to have been designed specifically for cycle-touring. Stay in lodgings in the town of Paso Robles. More quiet, very scenic back roads out of Paso Robles, and then a long run north through open valleys of waving grasses and scattered old oaks. A landscape for the most part unchanged since the days when the first Spanish explorers came this way hundreds of years ago. Reinforcing the feeling of stepping back in time: camp on the peaceful grounds of the Mission San Antonio de Padua, one of the best preserved and most authentic of the old missions. Showers. Or stay at the Hacienda Ranch House. The route rolls downhill into the nearly flat agricultural fields of the Salinas River Valley before climbing into the hills on the eastern side of the valley for a pleasant run north to the eastern entrance to Pinnacles National Monument. Scenery along the way varies from rolling, oak-dotted hills, to fields of lettuce and chili peppers, to remote canyons filled with wildflowers and sleepy little creeks. The plan is to camp at the eastern entrance to the park, transport the bikes and gear to the western side of the park, and hike through on the following morning, before the final day’s ride. (A sag wagon or truck is required to do this properly, but if you don’t have that option, talk to me: there are alternatives.) Showers and a swimming pool at camp.